This new text is based on the undergraduate course taught by the author at RPI for many years. 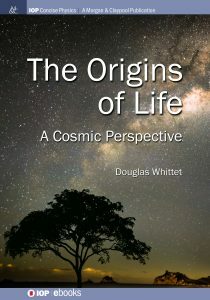 It provides insight into the environments and processes that gave birth to life on our planet, and assesses the probability that life has arisen (or will arise) elsewhere. An overview of relevant concepts, methods, and theories is presented, along with a summary of the latest findings. The book is intended for mid- and upper-level undergraduates and beginning graduate students, and more generally as an introduction and overview for researchers and general readers seeking to follow current developments in this interdisciplinary field. Readers are assumed to have a basic grounding in the relevant sciences, but prior specialized knowledge is not required. Each chapter concludes with a list of questions and discussion topics as well as suggestions for further reading. Some questions can be answered with reference to material in the text, but others require further reading and some have no known answers. The intention is to encourage readers to go beyond basic concepts, to explore topics in greater depth, and, in a classroom setting, to engage in lively discussions with class members.